Besant technologies rated as the Best Training Institute in Chennai & Bangalore for latest technology with Certifications. Overall we are having 15+ Branches in Chennai and Bangalore city. We are Very Popular Training Center for Python training, Data Science Training, Big Data analytics training, Hadoop training, Dot net training, Oracle training, Java training, Android training, R programming, AWS training, Selenium training, Salesforce training, Linux training, Informatica training,IOS training, AngularJS training, Web Design training, Digital marketing training, DevOps Training with Hands-on Classes in Bangalore and Chennai. About Our Trainers:- We Provide Most Experienced trainers for Data Science, AWS, Python, DevOps, Big Data Hadoop, Java, Oracle, Selenium and AngularJS Courses along with Placement Assistance. Besant technologies Offer Certification with all the training Courses which will helpful for the Students Future. Our Course Material and Syllabus is very unique which will make you Master in the latest technology. 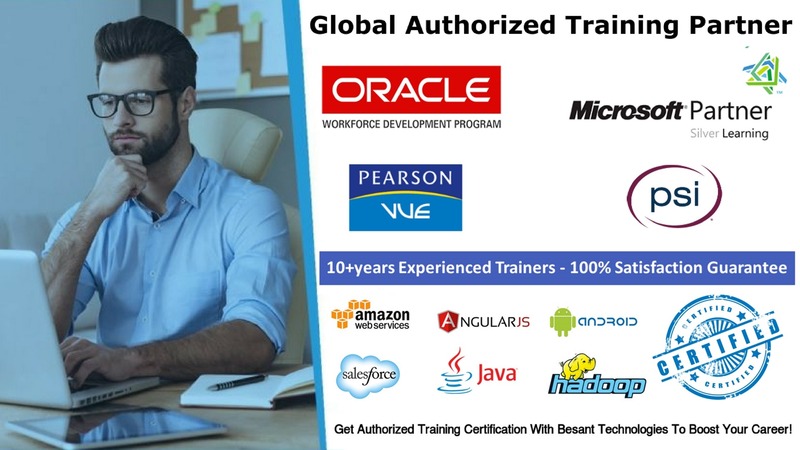 Types of Training in Besant technologies:- We are Offering Classroom , Corporate and Online Training with the help of 20+ Years Experienced Trainers in Chennai and Bangalore. Enroll for Trending Courses like AWS, Data Science With Python/R, SAS, Angular 2/4/5/6, Android, C C++, DevOps, CCNA, IOS, Blue Prism in Bangalore & Chennai. Please Check Our Students Reviews about Besant technologies training and placements. Besant technologies Bangalore Training venue: More than 150+ IT Training Courses we run in our Besant technologies Bangalore Branches (BTM Layout, Marathahalli, Jayanagar , Rajaji Nagar, Kalyan Nagar, Indira Nagar, HSR Layout, koramangala and electronic city). If you are looking for Best Coaching Center in Chennai please contact 7624941772/7624941774 . Besant technologies Chennai Training venue: More than 200+ Software Training Courses we run in our Besant technologies Chennai Branches (Velachery, OMR, Tambaram, Porur, Anna Nagar, T.Nagar, Maraimalai Nagar, Siruseri, and thiruvanmiyur). If you are looking for Best Coaching Center in Chennai please contact 9962528293/4. Learning a technology with a professional who is well expertise in that solve 60% of your needs. We support any training should be more practical apart from theoretical classes. So, we always gives you hands-on training. We started with 2 trainers, now we are 60+ and it’s still increasing. So we can give the students flexibility timings. We are dead cheap in fees. We are having options to make the payment in instalments as well if needed. If you need software assistance we are here to back you up. Bring your laptop or desktop and load the required software and learn. We are giving 100% job assistance with more corporate companies as clients and we schedule interviews for every student. If you are in dilemma to choose a course, we are having experts in counselling team to help you with perfect projection of your career. We have every course material to understand which is prepared by our trainers and we will share with you after session completes. To get a proper career in IT the important point to have a good resume. It projects your strengths and we will help you to solve this. Every course in covered with interview point questions and real-time scenarios of what the company may look after from you. We are located in velachery which is easily accessible by every mode of transport.